Roelf,the owner of the estate we are renting a villa on, told us about different animals that live in the area. First, one of the animals that be found on the the property are European Badgers. 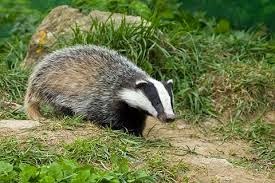 Badgers usually are nocturnal and are generally peaceful and sometimes even share their den with other animals, such as foxes and rabbits but they have been known to attack humans before and they can be vicious if provoked.They are very neat animals and they often change the bedding of their dens, pushing out soiled bedding and dragging in fresh bedding. There are numerous badger holes that I have seen on my walks here. Roelf said that badgers are protected and therefore are safe from French hunters who take hunting extremely seriously. He said to be careful: "don't insult the French hunters because they are very proud......and they have guns!!!!" 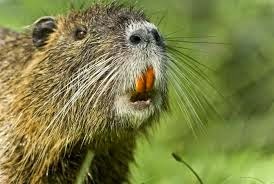 Another animal found here, that originated in South America, is the Coypu (or in French, ragondin), also known as a beaver rat and they live near rivers. This is also an animal that lives on our property since we have a river that runs through it. They are very shy and run away from people. 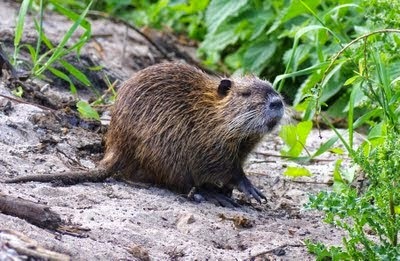 It is a semi-aquatic rodent, a herbivore, and resembles a very large rat or a beaver with a small tail. It has a beaver face with the slanted teeth!!!! The teeth are bright orange!! Kinda creepy!!! They were brought here by fur ranchers and are now an invasive species that can be hunted. The animal that also lives in France is the wild boar. They can attack people, and can run very fast. They are more likely to try to attack when they have babies and want to protect them. They are very big and have razor-sharp teeth and some have tusks also. They are omnivorous, meaning they eat pretty much anything, but survive here mostly on fruits, berries, grubs, and nuts. They ruin fields and crops in the process of finding food and the French government actually pays farmers for some of the damage they do to their land. 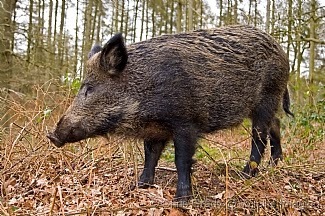 Boars are hunted for their meat and 10's of thousands are killed each year in France. It is hunting season here right now. They are mainly nocturnal and Roelf says they can be seen here sometimes at sunrise or twilight. I haven't seen any of these animals yet, but I hope to see them while I'm here, but from a safe distance, of course!!!! !